The fabulous seaside town of Kilkee in Co.Clare is renowned for its magnificent views of Kilkee Bay and the the cliffs which surround it, and, it’s a perfect base from which to set about exploring the rough and rugged Wild Atlantic Way. 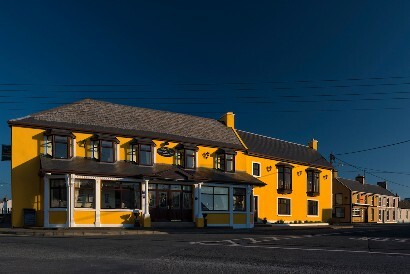 Established all the way back in 1883, the Bay View Hotel in Kilkee is a truly a great place to hang your hat whilst taking in all that the west coast has to offer. Stylish and well maintained, this boutique Victorian townhouse, run by the Hickie family now for five generations, in the heart of Kilkee Town is warm, welcoming and offers all the modern amenities that one expects in the modern world. Offering single, double, twin and family rooms, all en suite, the Bay View’s fifteen beautifully-styled guestrooms are well equipped for all comers. All of their rooms also feature, as standard, flat screen TVs and WiFi, irons and ironing boards, hairdryers and tea and coffee facilities, as well as with luxury bathrobes and complimentary toiletries. Some rooms even boast fab views out over the bay. Once you’ve checked in, pop your head into Hickie’s Bar, a traditional Irish pub with contemporary twists. It’s an ideal spot for a relaxed drink at any time of the day. The service is great, and, with live music every Saturday and six nights a week in season, as well as 3 big screens to cater for all live sporting events, it’s got a little bit of something for everyone. If you’re feeling a mite peckish, check out their bar menu which runs from 12.30pm-8pm daily with everything from meaty steaks to tasty seafood chowder. For a more formal dining experience, book a table at their Pier Restaurant, where, they serve, amongst other dishes, a fab selection of fresh locally caught seafood, like golden fried crispy scampi with twice cooked chips, lime & coriander tartare sauce and a tossed summer salad. The carnivore is also well catered for here with options like beef burgers, 10oz sirloins as well as lamb and poultry dishes as well. Once you’ve fully indulged in the hotels facilities, take advantage of the location, which is within walking distance of the beach and promenade as well as local shops and restaurants. Kilkee has always been a popular Irish holiday spot, offering safe beaches, beautiful scenic walks, tennis, surfing and two golf courses – Kilkee Golf Links Course and the Doonbeg Golf Links Course designed by golf’s famous ‘great white shark’ Greg Norman – so, what are you waiting for? Book a stay at the Bay View and go see for yourself.